Since opening Bapsicrafts, I’ve filled and sold at least a hundred knit items for now-warm people all over the world. By now the process has become automatic—another safe space to meditate (which is just the kind of thing I was going for). Here’s how each Bapsicrafts item is typically made, from start to finish. I took the time to document an order made for a good friend of mine in Canada for this post. Planning, Materials— It always starts with an idea. Most of the custom orders have a simple pattern-color combination, so I’ll pull up the pattern I wrote for the particular design(most have been memorised by now), order the yarn and get going. This customer wanted something more specific, and he was diligent enough to pull up reference to help me get an idea of what he was looking for—a striped Chullo style hat, with a red and gold color scheme. He also wanted 100% wool. After I understood the request, I set up a listing and got to hunting for the perfect yarn. I chose an Andean wool, seemed fitting for a Andean style hat. Stitching — This is easily the longest part of the process. For a hat you’re looking at about 7-8 hours usually, or about 4 for a pair of wrist warmers, typically done while I’m watching a show or reading a book! Since many completely custom pieces are designed from scratched or improvised, it can take even longer to get just right. I had to frog quite a bit of the work to make sure everything fit as planned. In total I think this hat took about a week on-and-off to create, not counting design sketching and the like. Special Touches — I always like to add a little something that makes a custom piece just that much more unique. In this case I added a crocheted border to handle the stockinette stitch curling, and to better balance the red and gold color relationship. I also set up and braided yarn to use for the tassel part of the hat, which was really fun to do! Hand washing — After everything’s just right, bound off, with every end woven in and knotted, I’ll wash the piece with a hand made soap, reshape, and leave flat to dry. 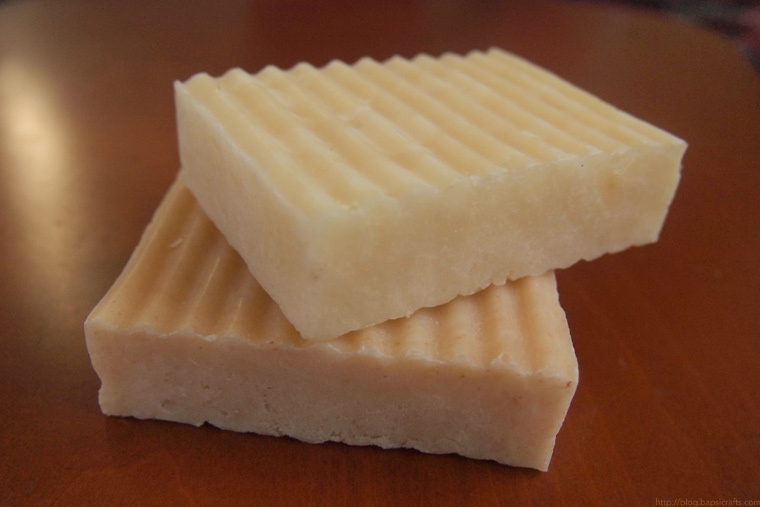 This soap in particular is the previously blogged Wool or You bar by Sweet Tea N Biscuits. It smells like heaven. My Signature — After allowing it to dry for a day or so, I'll 'sign' my work with a hand sewn label. I source my labels in small batches from the lovely Michelle Ruyle of Inked Papers, a small business based right here in the United States. Wrapping it up — After all of that, I have the pleasure of carefully wrapping the piece up like a little gift, including a personally handwritten note and some care instructions. I prefer to keep the packaging simple and minimal, but still meaningful. Here, I had enough yarn left over to make a little bow to match the color of the hat. Then it’s just taking it to the post office! The finished piece will take its long journey to its new owner. To place a custom order find my shop Bapsicrafts, and send me a message via Etsy. Let’s work on together on something new! A little while ago I ordered some handmade soaps from Sweet Tea N' Biscuits on Etsy. Since I clicked purchase it had been an anxious wait for a little padded envelope to arrive at my door! Thankfully it arrived safely, and promptly--and securely packaged to boot. When I opened the package, a sweet scent overtook my senses. I knew I was gonna love this soap. Holly even packed a little thoughtful gift, a sort of thing one would only get when shopping handmade. My gift was of ginger peach tea, and a teeny sample of another one of her soaps. By this point I was already sold on her work so I’ll be happy to send the sample to the first curious reader who e-mails me. :] As for the tea, I brewed it right away. I adore trying new blends. The one challenge to shopping for things like soap online is the adventure of purchasing soaps that you think you'll like based on its description. I personally like the thrill of it, but some may find it an uncomfortable gamble. Let me say that in this case, I took the chance with her Absinthe scented soaps and was not at all disappointed. The top lighter colored bar in the photo below is named Absinthe. I can’t find the right words to accurately describe the scent of this particular soap either, but I do completely agree with Holly that it’s a beautiful gender-neutral scent. It smells crisp, nice and clean. :D The other soap, made with the remaining fragrance for a past customer has a bright and citrusy scent. I’d like to argue that the soap is gender neutral as well. And now that I’ve tried it on my woolens, I can vouch for that! 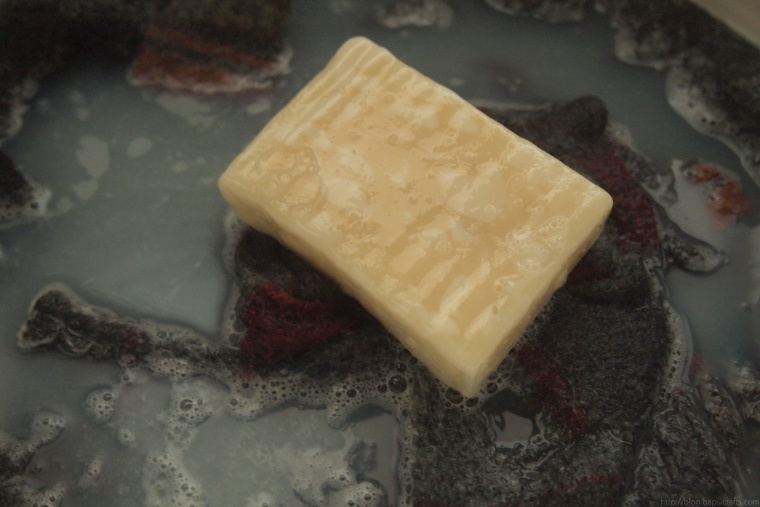 I ran out of some of my favorite woolen soaps while in England, so I resigned to putting the sturdier blends in the washer with the rest of my clothes and laying flat to dry. This left the socks with an undesirable texture, especially around the heel. Now it’s totally possible that I’m committing a hand-washing sin, but I went ahead and gently scrubbed those bad parts of the sock in an attempt to save them. The rippled texture of the soap was just perfect for that! The socks felt as nice and soft as when they were when first blocked. Kookaburra used to be the rinse of choice for personal and Bapsicrafts knits, but after using my personal knits as a guinea pig (with success) with Sweet Tea & Biscuits soaps, I think I have made a good soapy-friend. I feel better knowing how much less wasteful the use of a solid bar for handwashing is compared to liquids, and am happy to make the change to solids (and to handmade)! Both soaps are what Holly calls "Wool or You". They're both made with lanolin, an oil great for your wools and for your skin! Lanolin is known to many as a wonder moisturiser, and after feeling its effect on my hands after the wash, I can agree. Overall, I'm a happy customer. If you're looking for a light soap to use for your wooly handknits (wool-acrylic blends love a good bath in lanolin soaps too!) I recommend this shop as a great place to get started. You can visit Holly at Sweet Tea N' Biscuits here. And like Sweet Tea N' Biscuits on Facebook for her witty posts, soap updates, and if you're lucky, maybe a giveaway. In these two years I've knit 34427 meters of yarn(according to knitmeter), made 98 sales that are warming lives and homes as we speak, followed nearly a hundred knitting blogs, interacted with and befriended many fellow crafters, craft-lovers, and small business owners. It's been a joy so far and I hope for many more days of learning, growing, sharing, and (of course) knitting! To celebrate these fun two years of crafting and selling handmade, I'm holding a sale until the 28th--you can get 15% off anything and everything in my shop with the code HBDBAPSICRAFTS. This will even include any custom orders or requests--I'll apply the discount to the quote when we talk about your vision. 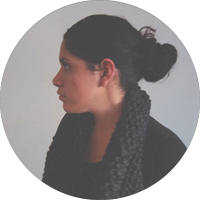 Jenna started blogging at hardknitlife just last month but has been doing a very entertaining job of it so far. Give her a read! Sandra Singh is currently holding a giveaway for her Sieden Prairie Cowl--ready to knit with 4 skeins of Sandra Singh 1 Ply Merino Worsted in your color scheme of choice. Enter for your chance to win it! Susan bound off a pair of ombré socks with yarn spun KnitSpinFarm's batts. I wish I could spin--those socks are just divine. I announced this a little while ago already on facebook, but there’s something about blogging that makes me anxious. It is the relatively formal format? Maybe. It is my inability to explain something that I feel more comfortable designing visually or discussing one-on-one? Pretty much entirely exactly absolutely. But I’ll feel the fear and try anyway. I remember (admittedly only vaguely) studying about this in high school. I responded a little emotionally to the importance of this part of your nervous system. It takes a large amount of effort for a signal to make it for the first time from one brain cell to another. but having made that connection for the first time it eventually gets easier to do. With time, that message or signal can take next to no effort at all to get across. The bond’s been strengthened. Now, I have it totally wrong about this bit of neuroscience here (my class notebooks were more sketchbooks than anything else oops), but it wasn’t hard to immediately connect my understanding of the concept to the initial difficulty of making that first connection to another person and to begin a relationship. The thought of your first “hello” becomes this massive ravine that gets wider and wider the more you think about it, but after you manage to cross it, things get a little easier don’t they? Over time that metaphorical line you bravely threw across the ravine becomes a solid bridge, and now you have a good friend you can share just anything with. It’s almost like not sharing is the unnatural thing to do. That space between you and everyone you connect with is always a very important thing. I made this design synapse because I’m just so enamored with that little space between you/me and the world that I think is a necessary and beautiful thing. I wrangled with garter ribbing to give the impression of spaces getting gradually smaller as you reach the brim (or gradually larger if that’s your perspective). My long-time readers will know that I love ribbed knitting—it’s stretchy and plushy, and offers a sleek line along the length of your head when its worn. I had a lot of fun seeing this come together on paper and the needles. Every new knit design I make further cements my love for knitting and sharing handmade, and I’m excited to see Synapse and other Bapsicrafts designs become a part of someone’s slow-fashion closet/lifestyle. 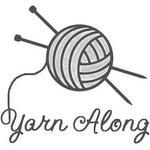 This post is made alongside many others in Gsheller's Wednesday Yarn-along! and let me know if you decide to join! I made a lot of additions to the shop in the past month, and this set of three's been my favorite so far. If you told me two years ago that I would fall in love with bright colors, past-me wouldn't have believed you. I've been on a little hat-knitting frenzy for the little shop lately, thought I'd update you all about what's been listed! Click through the photos for each hat's listing in my shop. These two were made to be sister pieces--after knitting the first one in tan and black, I saw that I had enough yarn left over to make a ctrl+i version, so I went ahead and did it! They both turned out really beautiful, I might work on more sets like these in the future. I think my favorite feature of these two hats is the versatility. The hats were knit just long enough to be worn slouchy like in the first two photos in the post, but just short enough for the brim to be folded over for extra warmth. It appeals to the part of me that wants just a few good useful things in her closet for different occasions. I've found myself to be a terrible judge for what is guy-friendly as far as knitwear goes. Feedback so far from male friends has been positive, so it may be safe to say that these can make good gives for sisters, girlfriends, and boyfriends and brothers alike! As always, you can learn more about and buy these hats in my little shop, Bapsicrafts. you can view the listing for your own custom made knit headband here in my shop. i finished up a new design that i've been excited to share for a while--here! my favorite moss stitch in the form of a warm cowl, with a little bit of crochet on each end as a finish. for this design sample i just had to use a deep hue so i went for cranberry. i'm very happy with how it turned out and would love to learn how it will look in the colors my customers may choose for their own. moss stitch hasn't failed to wow me yet--i absolutely love the texture it creates in different weights or materials. this cowl is currently available in a soft blend of lamb's wool and acrylic. you can see a bit more about this custom-knit neckwarmer here. i had the pleasure of being interviewed by kelly stahley! You can view the interview on her blog here. and remember to enter my giveaway for the vegan shift hat here! i will draw the winner's name at the end of this month! i am very excited to say that a giveaway of a special bapsicrafts item is coming soon this winter. stay tuned! this is finlet, the newest addition to my shop. it's a neckwarmer that i actually put together a few months ago that i really love but had mixed feelings about making it available to buy, mostly because of the amount of time spent actually knitting it. for a long time i kept the prototype myself but recently made the decision to make another for the shop, since i loved it so much. one big challenge i have with selling my knitwear is pricing them in a way that could seem reasonable to customers. i spend many hours swatching, searching for yarns, knitting and ripping back, and writing the patterns for my pieces, but there is always this lingering fear that despite my best effort, the level of craft in my work won't be made clear enough to people browsing my shop. i guess when all is considered the best i can do is price in a way that is fair to my skill, service and high level of quality of my materials, and take the best more true-to-life photos i can and hope there are people out there who recognize that value and choose to make bapsicrafts a part of their wardrobe and lifestyle. finlet is a much-loved design of mine, and i hope it finds a good home and owner to keep warm this winter. etsy is filled with so many beautiful things! this one i made with the pretty gold and grey color theme in mind. as always, you can click through to see the treasury page. find anything beautiful on etsy lately? send it my way! have an unabashedly late post--what can i say, ideas come to me at the weirdest times of night! i've been in dire need of some printed care labels for my orders--all i've used since was this little kraft tag for thank you notes, which would work just fine if my penmanship was any good. so i looked in my paper stash and found this beautiful sheet of mi-tientes from my foundation drawing year, and got to work on my little design. about an hour later i was finished cutting and arranged them in a cute little stack! i think i'm by no means knowledgeable about layouts and probably committed a multitude of graphic design sins, but i'm pretty proud of what i managed to do. if nothing else it will at least help make sure my little handmade things last as long as possible in their new owners' hands. have any great ideas come to you at random lately? what have you done about them? tonight i'm working on a sort-of but not-really stashbusting project, a ravenclaw cowl for my shop. i wouldn't call it stashbusting if the yarn's already tied to a project, but the feeling of seeing one less skein in the basket is the same. it's a little project for me to take the yarn i've purchased for my harry potter cowls and knit them all up--both for the joy of emptying the basket and to offer them as a ready-to-ship item for the holidays. the hope is that having them available to them as soon as i possibly can will help make shopping with me more enjoyable! i'm really beginning to enjoy putting together little treasuries. there is so much impressive photography on etsy, it's hard not to want to make little mood boards with them! here's one i made recently--i just might do a little treasury feature every week, haha. [as always, you can click through to see my treasury and the beautiful products featured. released a few new little knits in my shop recently. as usual, you can click through the image to see the listings on etsy. this one i'm proud to call my first fingerless mitts design both made and listed in my little shop! knitting and shaping in the round is a little daunting for me when it doesn't involve a simple crown shaping, so i'm glad i tackled that! more designs are definitely coming soon! this color featured is denim, a personal favorite right now. i'm excited to see how this piece looks in other colors as well! this one's been a simple favorite that's been sitting in both the notebook and shelf for a long time. the torse beanie, named that because of the ribbing pattern and other little design features that mirror features of the human torse. i loved making this design so much that i decided to make a number of ready-to-ship versions for people to be able to order and receive immediately! but as usual for my designs, this will be available in the customer's choice of colors. it will be really interesting to see which will turn out to be the most popular! and these i've been keeping in the works for a long while, but finally decided to make available--little white cotton scrubbies in a set of 7! hopefully someone loves them! i may offer them in different quantities if they're ever requested. i have many more little knits waiting for their photoshoot [which i've been putting off because i'm overdue for a haircut..]. i can't wait to show them and hopefully ship them! here's the first of a few designs i finished recently! this one's named the ceph for the evolutionary trend of cephalization, where nervous tissue becomes more concentrated on one end than on the other, which eventually forms a head with a brain. it's one of my favorite things to mind when designing simple creatures, as it's something that causes the area of interest and the line of symmetry in things to change. anyway, went with my current simple favorite k1 p1 type pattern, which works a lot for what this is. it's really beautiful to me how such simple things like the knit and purl stitch have the potential to create very interesting, detailed knitwear.